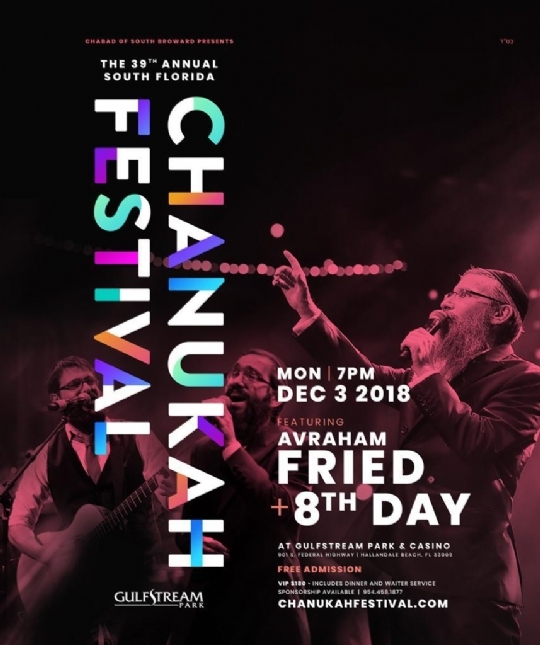 The 39th Annual South Florida Chassidic Chanukah Festival, the World’s Largest Annual Chanukah Festival, is set for the second night of Chanukah, Monday, December 3, at 7PM, at Gulfstream Park and Casino in Hallandale Beach. The Festival features this year, the King of Jewish Music, Avraham Fried, Live In Concert, and the most popular Jewish musical team, 8th Day. Rabbi Raphael Tennenhaus, Chabad’s Executive Vice President, reminds everyone that: Admission to the Festival, as always, is FREE! Ever since the Festival moved to Gulfstream in 2007, crowds of 10,000 people and more have participated in the South Florida Chanukah Festival. Looking at the events today, you start to wonder. The story of a little candle pushing away the monster of frightening darkness, of human sensibility overcoming terror and brute force, of life and growth overcoming destruction - the battle is very much alive within each of us, and in the world outside of us. It reoccurs at every winter solstice, at every dawn of each day, with every photon of sunlight that breaks through the earth’s atmosphere bringing with it warmth and life-nurturing energy. With every breath of life, every cry of a newborn child, every blade of grass that breaks out from under the soil, every decision to do good in the face of evil, to be kind where there is cruelty, to build where others destroy, to move humanity forward when others pull us toward chaos. And that is Chanukah. Chanukah is an eight-day spiritual journey. Many people know the story of Chanukah, but only as a historical pretext to give gifts and eat latkes. We can call that the body of Chanukah. The soul of Chanukah is its meditation, joy, warmth and light. Not only in our homes with our loved ones, but with the entire world. Our hope is that by igniting our souls, everybody will follow and light the world, one candle at a time. Indeed, the lights of the Chanukah Menorah are a symbol of freedom from oppression, freedom from tyranny, and freedom of religion. It’s a reminder to people of all backgrounds, that a little bit of light removes much darkness. Chabad of South Broward Headquarters holds the distinction of hosting and sponsoring the World’s Largest Annual Chanukah Festival for the past 39 years. Tens of thousands of people, from all walks of life, have participated at these Mega Chanukah Festivals, broadcast live around the world via Chabad.org. In addition, thanks to Chabad of South Broward’s initiative at a Miami Dolphins Football game back in 1987, this trailblazing event has brought the Chanukah Menorah and message of Freedom to millions of people around the world, at Football, Basketball, Hockey and Soccer games. When you think of Global Chanukah Outreach, you think Chabad of South Broward Headquarters. The Chanukah Festival will also feature Cantor Rabbi Yossy Lebovics, lighting Florida’s Largest Menorah with scores of community dignitaries and leaders, real Chanukah Gelt and gift packages to thousands of children in attendance, Kosher food at a nominal fee, and VIP seats @ $180 per seats. Sponsors of $1,000 or more will have an opportunity to display their business ads on the huge screens at Gulfstream, sponsors of $1,800 and up will have food delivered (at no cost) to their VIP seats, sponsors of $5,000 and $10,000 and higher, will participate in the passing of the torch of light ceremony before the Menorah Lighting. Rabbi Tennenhaus concluded,"Every year the Lubavitcher Rebbe, Rabbi Menachem M. Schneerson (1902-1994) gave us a blessing for our Chanukah Festival. One year, the Rebbe gave us a blessing that: The Chanukah Festival should grow each year like the lights of the Menorah grows each night. Thanks to our generous sponsors, the 39th Annual Chanukah Festival on December 3rd, will be our biggest and best in our nearly 40 year history." For more information about the Chanukah Festival, to buy VIP seats, and/or to help sponsor the Chanukah Festival, please log on to ChanukahFestival.com .